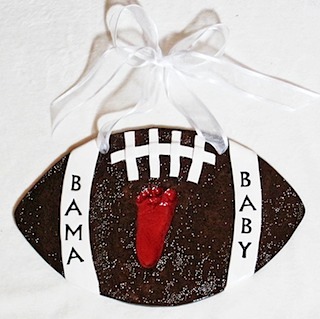 Football Team Impression design with Team Name Stamp. $65 This piece is textured like a football and painted to look like a football. I can paint whatever colors you wish and stamp whatever team lingo you desire. (Roll Tide!!) There is limited room for letter stamps, so if your wording is long, I can paint it in either curly or block script. This piece can either be hung with ribbon or made without holes to place in a stand like the one pictured on the right. Current age and birthdate engraved or painted on back. Come on sports fans!! 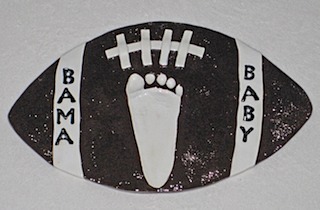 Are there only BAMA folks out there interested in this design?? Support YOUR team!! Choose any colors you want.